Safe to children: high-quality wood material with smooth surface, no sharp edges, and using non-toxic paint, super safe for children to play with. 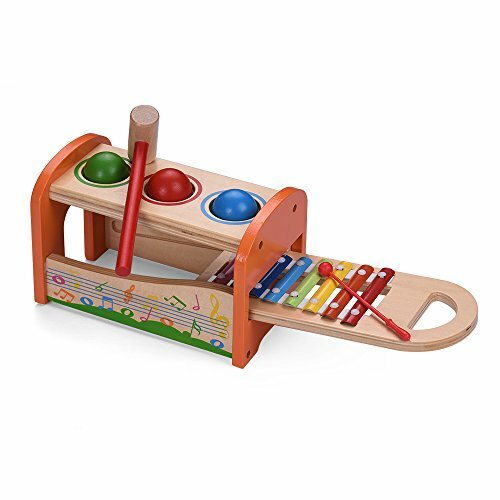 Clever construction and colorful design: xylophone and knock-ball game are combined into one tap bench, plus the bright colors and cute patterns,children will be willing to play. Easy and fun to play: the xylophone can slide out to play, just using the included plastic mallet to knock the metal keys to play melodies or simple songs, or knocking the balls by the small wooden hammer. Children can play it with their ways. Educational musical toy: cultivating children's coordination ability of hands and eyes; promoting sound recognition and fine motor skills; improving kids' practical ability, music sense and learning skills, etc. Ideal musical gift: it is a great musical toy for your children or your friends' children as birthday or festival gift. Children will love it so much. This product is specially for 3-year-old or above kids to play with. Kids under 3 should be accompanied with parents. Do not let the kids put the mallets into mouths and be careful not to poke into eyes. Easy and fun to play: the xylophone can be slided out to play, just using the included plastic mallet to knock the metal keys to play melodies or simple songs, or knocking the balls by the small wooden hammer. Children can play it with their ways. If you have any questions about this product by Muslady, contact us by completing and submitting the form below. If you are looking for a specif part number, please include it with your message.